You learnt Java untill now because, the official language for creating Android programs is Java. Hurray! Now you can create Android programs which can run on your Android device! If AppCompat is checked then Android will add backward compatibility libraries which makes your application built with the latest API still work with earlier versions. Give the domain name other than com.example in the above screen. The ‘Project location’ directory is where the project is physically stored on your machine. Each version of the Android API has a ‘Level’ number. Each API level will have its own capabilities, behavior and user interface collectively called API features. API level that you choose determines which Android device you want your application to work best with. This is mainly meant for applications which are distributed through Google Play. If you are not distributing your app for consumers to download, then the API level that you choose is based on your specific needs of your application. As soon as you create a project and also when ever you make any changes, gradle kicks in and starts building your project. You will see the gradle status in the bottom pane of your IDE. Always wait till it finishes all its compilation before you conclude your code is not compiling. Lower levels of the API will be supported by more devices, while higher levels will be able to handle more advanced functionality. With that in mind you should configure the emulator to use the lowest level API that has all the features that your application must support. Note: Testing on your real device is both easy and fast. So you will mostly deploy your app on your device. You can plug your phone into your computer via the USB cable and run your applications following similar steps as shown below for deploying to an AVD. If a device is connected, it will show up along with the AVD&apos;s that you created. An advantage of this approach is that it is likely to run more quickly. Depending upon your device you may need to download the driver for your phone from the manufacturer’s Website. While it is best to use your own device, there are instances when you need an Emulator. Supposing you want to test on a device which you do not have? Then an Emulator comes handy as you can create an Emulator simulating a plethora of hardware devices and also on all varieties of Android SDK. AVD&apos;s are nothing but simulations of mobile devices running on a Java program. You can set up an AVD to run a particular version of the Android API, set the screen resolution and add hardware capabilities such as Accelerometer, Camera or Battery support. However AndroidStudio also makes it seamless to create an AVD and deploy your app. Once you choose the green arrow, IDE will guide you through selecting the emulator. Since we chose API level 24, you have to choose the corresponding emulator device which supports API 24. Note, IDE will help you download the respective emulators and/or API libraries if you choose an emulator and API which are not already installed on your IDE. You will be able to run the emulator supplied with the Android SDK to mimic the behavior of any supported API version. Once the project is closed it brings you to the Android Studio&apos;s welcome screen. From here select the &apos;x&apos; mark to remove it from Android Studio&apos;s memory. However note that the files are not really deleted from the filesystem in this step. The project is not longer remembered by Android Studio. To finally get rid of you files, you have to open your File Explorer or any program of your choice and manually delete the folder which contains your Android project files. and to remove the folder, run remove command with &apos;r&apos; for recursive and &apos;f&apos; for force; basically means recursively remove all the files from &apos;MyApplication&apos; folder. After this step your project is fully removed from your computer. Be careful before you run this step though. Alternatively you could used any of the File Explorer to accomplish the same task. When you created the project, the Android Studio automatically created the necessary files in various folders for the &apos;Hello World&apos; app. Now you will understand some of the key files and folders which make up an Android project. Android Studio provides many project structures based the selected types, namely Project, Packages, Android etc. To understand the basic files we will open the &apos;Android&apos; view. AndroidManifest.xml is the configuration file for the entire application. All the components that make up the complete application are listed out in this file along with user permission definitions and a host of other configuration details. activity_main.xml is the layout resource file that defines the user interface. This file is located under res/layout *MainActivity.java contains the code for the initial view of the application. This file is located under java folder. The actual file system file location is not displayed in this view. To see the complete folders in which these files are placed, choose &apos;Project Files&apos; in the top drop down menu instead of &apos;Android&apos; and you will see the full path of each file. The XML files under the "layout" folder are used to structure the user interface and to keep those details separate from the code. In "activity_main.xml", listed below, there is a ConstraintLayout container. The "MainActivity.java" class, under src folder, is a child class of Activity. You can think of each Activity as a single window which is opened by the system and presented to the user to view/interact with the program such as viewing a list, clicking a button etc. When the Activity is created, the XML layouts are loaded and made visible. The top part of the "AndroidManifest.xml" file defines the package that the application is contained in. The manifest also lists all the components of an application which includes the activities that the application can perform and the classes the application uses to perform these activities. In the listing below there&apos;s a single "MainActivity" activity. Inside the activity, an intent-filter element describes the kinds of actions this activity is ready to perform. 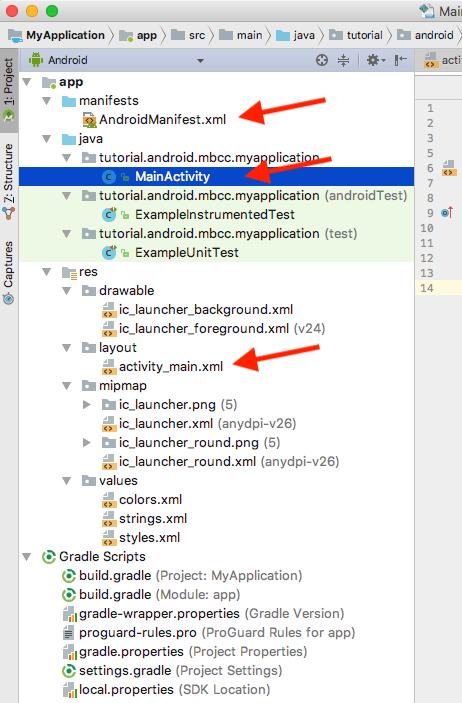 Inside the filter, Android Studio has added an action element called "android.intent.action.MAIN" that lets Android know that it should use this Activity to start the application when the user invokes the app from the home screen. Although this listing has only one Activity, a typical Android application will have many activities and only one Activity will be marked with the intent-filter action of Main. The manifest can get quite complex in a large application and can also include listing of other components, permissions used to perform certain activities, target platform software and hardware requirements etc..
Are you wondering what are all the other files and folders meant for? Here is the reference doc with full details: https://developer.android.com/guide/topics/resources/providing-resources.html Although you will be learning some details in small bites in the coming chapters, it is still a good idea to have a cursory glance at the file structure.